Umar Abdumutallab, the man who tried to blow up an airplane on Christmas day two years ago, has been sentenced in a federal courtroom in Detroit. NBC's Pete Williams reports. 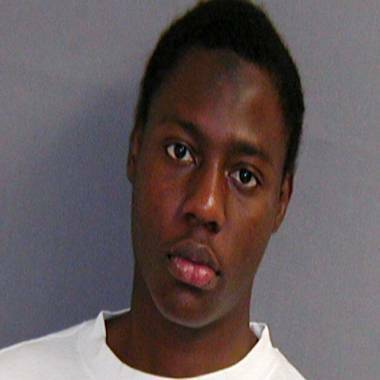 DETROIT -- Nigerian Umar Farouk Abdulmutallab, who tried to blow up a Detroit-bound international flight with and underwear bomb on Christmas Day 2009 on behalf of al-Qaida, was sentenced to life in prison without parole Thursday. The hearing before federal Judge Nancy Edmunds was an open platform for Abdulmutallab and passengers and crew of Northwest Airlines Flight 253 who wanted to speak. Abdulmutallab, 25, the son of a wealthy Nigerian banker, pleaded guilty in October and admitted he was on a suicide mission for al-Qaida when he tried to detonate explosive chemicals hidden in his underwear minutes before the plane landed at Detroit Metropolitan Airport. In his court statement Thursday, according to NBC station WDIV of Detroit, Abdulmutallab praised Allah and ranted that his life and the life of Muslims has changed. He said al-Qaida leader Osama bin Laden and other terrorists the government says were killed are alive. He called his sentencing hearing a day of victory and claimed U.S. attorneys on his case intentionally misquoted him and mishandled his case "to achieve their Hebrew goals." He said the Jews need to be "ripped out of Palestine … the capital of the Muslim world." Assistant U.S. Attorney Cathleen Corken played an FBI video to demonstrate the destructive force of explosives similar to those Abdulmutallab carried. A brief but intense flame was seen in slow motion when the explosives were detonated in an outdoor field on a sheet of aluminum sitting on two wooden sawhorses. RAW VIDEO: The Justice Department has released video of FBI tests showing the potential explosive force equivalent to the underwear bomb device Umar Farouk Abdulmutallab attempted to detonate aboard Northwest Airlines Flight 253 on Christmas Day 2009. As Edmunds said the sentence was "just punishment" for what he had done, Abdulmutallab sat quietly with his hands folded under his chin and did not show any reaction. The government said Abdulmutallab first performed a ritual in the airplane lavatory — brushing his teeth and perfuming himself — and returned to his seat. The device didn't work as planned, but still produced flame, smoke and panic in the cabin. In a defiant speech as he pleaded guilty in October, Abdulmutallab said he was carrying a "blessed weapon" to avenge Muslims who have been killed or poorly treated around the world. He admitted he was inspired by Anwar al-Awlaki, a radical American-born cleric and leading al-Qaida figure in Yemen who was killed by a U.S. drone strike last fall. Anthony Chambers, an attorney appointed to assist Abdulmutallab, had urged Edmunds to declare that a mandatory life sentence is unconstitutional, claiming it is a cruel punishment in a case where no one but Abdulmutallab was physically hurt. His groin was badly burned. Among four passengers and a crew member who testified, WDIV reported, was Kurt Haskell, a lawyer who was traveling with his wife, Lori. Haskell, reiterating charges in his blog, said the government conspired with Abdulmutallab to carry a defective bomb onto the plane to give the government a reason to install full-body scanners at airports. The Associated Press reported that passenger Shama Chopra, 56, of Montreal, also plans to speak in court. She ran unsuccessfully for the Canadian Parliament in 2011, a race she couldn't have imagined joining years ago. "I don't have to feel weak," Chopra said Wednesday. "I don't have to be scared of anything. God has given me a second chance to live." 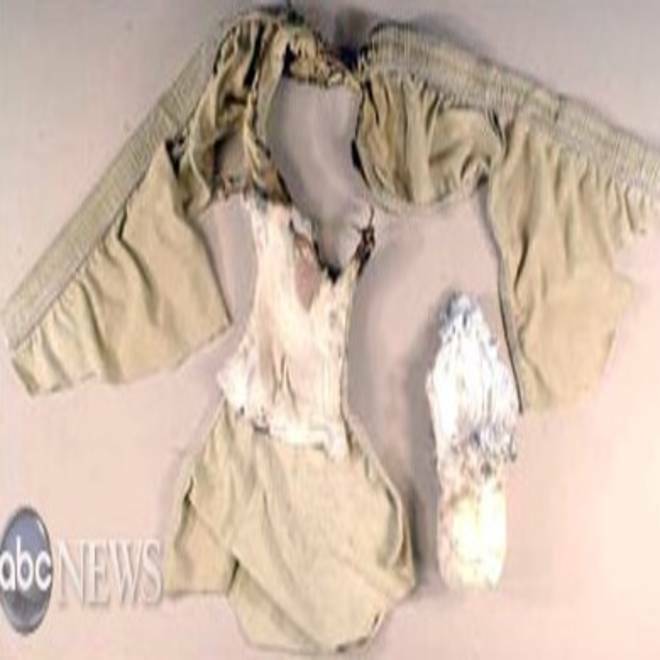 This handout government image provided by ABC news shows the underwear with the explosive worn by alleged bomber Umar Farouk Abdulmutallab in his failed attempt to down a Northwest Airlines flight over Detroit on Dec. 28, 2009.